Highland Hospital is honoring Cynthia Angel, M.D., as Physician of the Year, and Sheila Marcoccia, RPA-C, as Advanced Practice Provider (APP) of the Year. 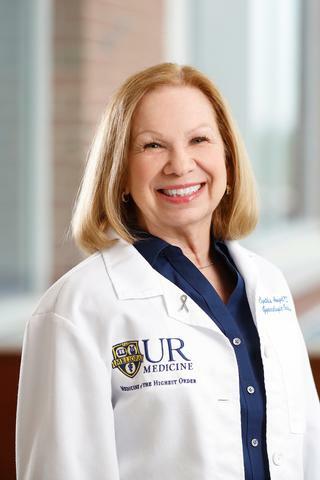 Dr. Angel, a Highland gynecologic oncologist, is also Professor of Obstetrics and Gynecology, University of Rochester School of Medicine and Dentistry. The Victor resident was nominated for the prestigious award, also called Distinguished Physician, by administrators, colleagues, and other co-workers for healthcare excellence. Dr. Angel received her Doctor of Medicine from the Pennsylvania State University College of Medicine and completed her residency in obstetrics/gynecology and a fellowship in gynecologic oncology at the University of Rochester School of Medicine and Dentistry. 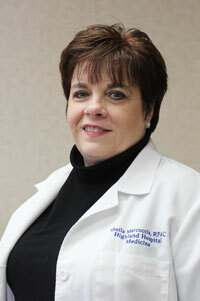 She has practiced at UR Medicine and Highland Hospital throughout her career that spans more than 30 years. Previous recipients of the Distinguished Physician Award include: Tulsi Dass, M.B.B.S., Bilal Ahmed, M.D., Theodore Hirokawa, M.D., Jeffrey Harp, M.D., Daniel Mendelson, M.D., Alice Taylor, M.D., Joseph Nicholas, M.D., Melissa Schiff, M.D., David Holub, M.D. and Youngrin Kim, M.D. A Pittsford resident, Marcoccia is a graduate of the Rochester Institute of Technology Physician Assistant program. She worked for several years in Cape Fear Valley Medical Center in Fayetteville, North Carolina before joining the Strong Health Geriatric Group in 2000 and inpatient medicine at Highland in 2006. Previous recipients of the APP of the Year Award include Abby McCarthy, RPA-C and Pamela Heiple, APRN-BC, NPP. Dr. Angel and Marcoccia will be honored at the upcoming Highland Hospital Physician Recognition Event.